It’s back-to-school season, and many kids who have been home all summer and ready to head back to the classroom. This is leaving many parents, like me, a bit apprehensive about certain things…but today, I want to talk about food. Our society doesn’t care about healthy eating. Oh, we say we do…and politicians try to “reform” what kids are being fed every few years. But really, we don’t care. This means that kids are offered straight-up junk and highly processed foods in schools and day cares everywhere, every day. Frozen pizza, boxed mac’n’cheese, cans of soup or pasta… It’s pretty much the norm. Plus, many schools like to reward kids with sugary treats, or do “special activities” that involve even more sugar. Some have done “cooking” classes that involve mixing up cakes from a box, or learning about the layers on the earth by sliding a straw through a cupcake. Right now, our children are not healthy. Childhood obesity and type II diabetes are growing at an alarming rate. Kids struggle to focus in the classroom, and they deal with outbursts and behavior problems. All of these issues — and more — are directly related to what they’re eating! One study shows that children who attended day care were more likely to prefer junk foods — because that’s what they were offered! (source) We have a great responsibility here. And I know. “Relax, it’s just once, let them be kids.” But no. This is happening constantly. They’re fed junk for breakfast and lunch at school daily. (Have you read the ingredients, especially sugar content, in breakfast cereals lately?!) They’re getting some type of “treat” at least weekly in classrooms for good behavior or some other reason. After school and on the weekends, they’re participating in sports, dance classes, scouting, and religious groups, and guess what — they’re getting “treats” there, too. These kids are going to grow up to think that eating junk food is the norm, and not even know what real food is — much less how to prepare it. We should all care about this! We all want children to be healthy, yet when we have the opportunity to teach kids about healthy food or unhealthy food, we vehemently defend feeding them unhealthy food on a regular basis! 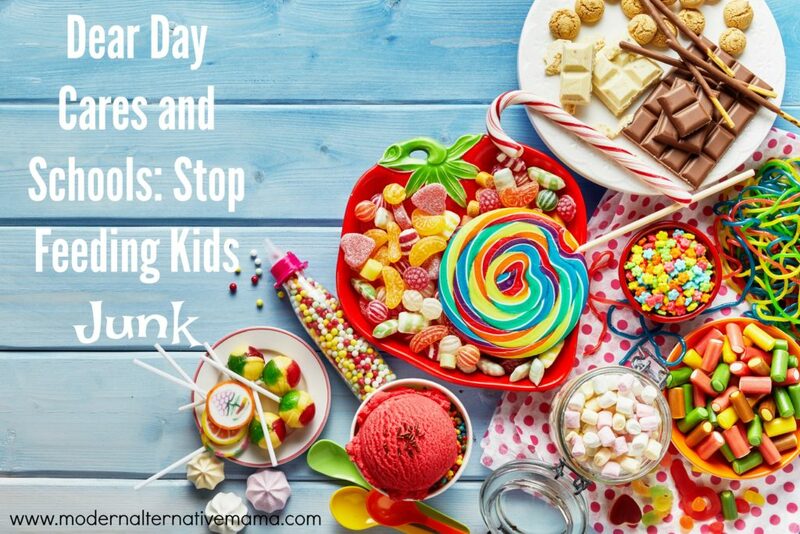 This year, instead of doing junk food-based special activities and rewards, consider skipping food all together (food allergies are on the rise anyway, so a lot of kids can’t participate), or offering healthy treats instead. Kids don’t need sugar to feel like their efforts have been noticed and appreciated! They just need to hear from the adults they trust that they have done a good job. When it comes to special events, parties, or food-related classes, try offering real food! Parties can have fruit and veggie trays, and offer fruit juice instead of brightly-colored fake “punch” or soda. There are lots of simple cooking projects that even toddlers can do (with adult assistance!) that involve real food. It is our job, as adults, to model healthy eating habits and to encourage children to consume a healthy diet. If that’s what they know…that’s what they’ll eat. This isn’t about making “bad foods” seem enticing or forbidden, either. If the message becomes “You have to eat this healthy food, that other food is so tasty but so naughty and I won’t give it to you,” then kids will rebel. But a simple, honest preference for healthy foods will set kids up for a life time of healthy eating. This will lower their risk of obesity, diabetes, depression, anxiety, heart disease, cancer, and more! Who wouldn’t want to do that? This year, make passing on healthy eating habits to children a priority. Say no to junk foods in the classrooms. 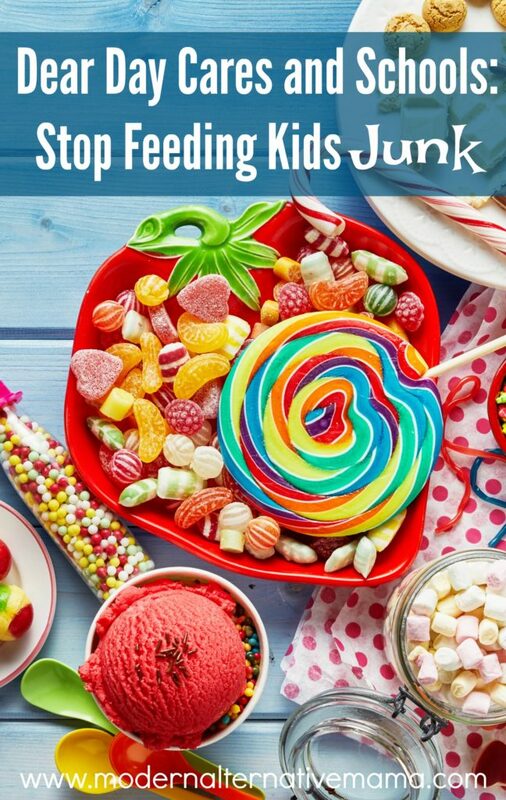 How will you promote healthy eating and stop feeding kids junk in your class? Thank you for this article, Kate. I like to think I helped inspire it from a post I did in the Facebook group last week. I’m going to send a link to the director at my kids’ school. I try so hard to educate the parents and teachers but so often I feel like it falls on deaf ears. Thank you for doing what you do!